LONG BEACH, CA-Alright, already. The Los Angeles Sparks don’t just have one MVP. They have two dominant forces. It’s still a while away, but that old saying of having two is better than one just might be enough for the Sparks to win the WNBA title this season. Nneka Ogwumike. Candace Parker. Parker. Ogwumike. Take your pick. Either one is good for a double-double whenever they step out on the floor. Both women can say they’ve been honored as the best of the best in the WNBA. Both players know individual achievements are nice, but winning a title has a much better ring to it. So what do Ogwumike and Parker go out and do in the Sparks’ semifinals playoff game against the Chicago Sky? Put on an MVP clinic. What else would you expect from the league’s dynamic duo. On a night where Ogwumike was officially honored as the 2016 WNBA regular season MVP, she and Parker sent a clear message to the Sky that the road to the championship round is going to go through them. The Sparks’ teammates played almost identical minutes (31 minutes for Ogwumike; 30 minutes for Parker), played neck-and-neck in the field goal attempts and made department (Ogwumike 11-14; Parker 11-15), crashed the boards with nearly equal ferocity (Ogwumike 10 rebounds; Parker 9 rebounds) and led the team in scoring (Ogwumike 27 points; Parker 30 points). Sounds like Ogwumike and Parker had a lot of fun in the Sparks’ 95-75 win at the Walter Pyramid on the campus of Long Beach State. They certainly played like they did. Parker took over early, scoring 19 of her game-high 30 points in the first half. Then it became the Nneka Ogwumike show in the third period as the superstar forward went off for 12 of her 27 points to put away any thoughts the Sky may have had of coming back a 17-point halftime deficit. 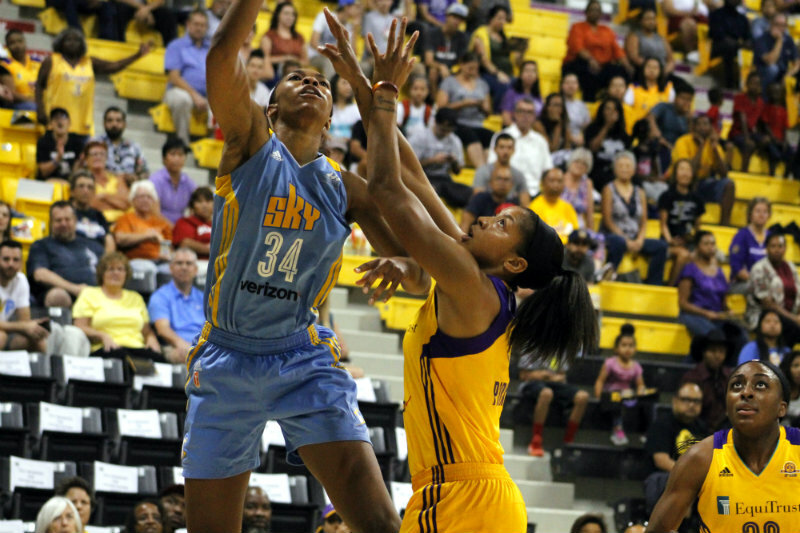 After sloshing their way past a mistake-filled first quarter, the Sparks, led by Parker’s 11 points, ended this drama early, outscoring the Sky 30-15 in the period to walk into intermission with a 52-35 advantage. Of course, it would be quite natural for both players to pay compliments to each other. Parker talked extensively about her adoration of Ogwumike. Ogwumike was just as efficient in her praise for Parker.